Cantilever vs Vertical Boat Lifts: What are they and which one is better? Canopies 101: Choosing the canopy that’s right for you! How Does the Purchase Process Go? Why Craftlander, Why Lifts and Docks and What is a Craftlander Boat Lift? Which Style Boat Lift is Right for Me? Vertical Boat Hoists are the most common hoists we sell. These hoists work for pontoons, tritoons, runabout, deck, fishing and ski boats. These are our most adaptable hoists and more than likely is what you are looking for. We offer vertical lifts with capacities from 2500# to 8000# and higher. Our vertical lifts vary in width from 108” to 132”. 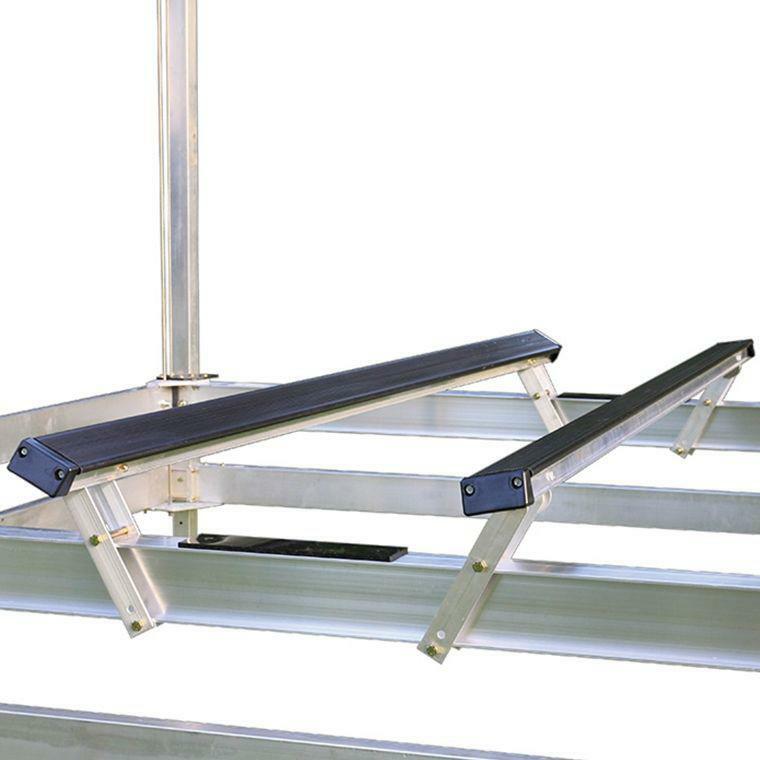 A Cantilever Pontoon Lift may be the right lift for you. 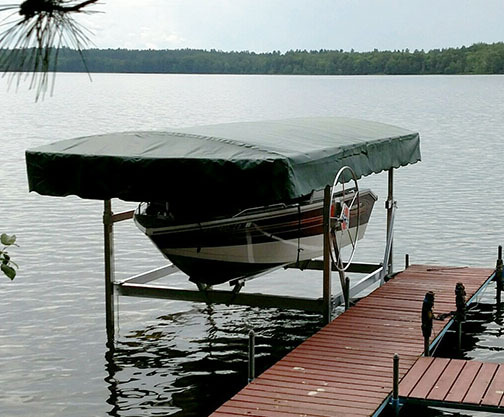 If you have a pontoon, do not have a need for a canopy and have a mostly flat lake bottom a cantilever pontoon lift may work for you. Cantilever pontoon lifts work in extremely shallow water and are inexpensive. This style lift is designed to lift from under the pontoon between the toons. These lifts offer good stability and are a great alternative to a more expensive vertical lift. These lifts do not adapt well to lake bottom slope. With the addition of leveling legs, they can handle up to 32” of slope front to rear. These lifts are 18’ long and longer. Also, these lifts work best in 42” of water or less. Vertical PWC Liftsare great for use in deeper water or in areas with heavy waves or water fluctuation. These lifts are designed similarly to our larger vertical lifts, just in a smaller package. Our vertical PWC lift has a capacity of 1200# and a beam of 63”. These lifts have a carriage travel of 60”. Our Cantilever PWC Liftsare a great value. We offer several models to fit your needs. Our Double PWC Lift allows you to lift two PWCs on the same lift. We offer double models with single winch or dual winch applications. We offer economy models and a more robust standard model with capacities from 800# to 1200#. Which Model Boat Lift is Right for Me? Pontoons and Tritoons require very different setups than other hull types. Boat hoists can be equipped with two different styles of bunks or racks for Pontoon/Tritoon use. Both styles of hardware are an additional cost to the base price of our vertical lifts. 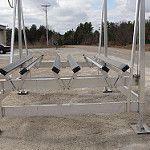 Our preferred method is the use of our standard Pontoon/Tritoon racks. This method is very stable and allows the lift to work in the shallowest of conditions. The racks also act as guide-ons for the boat. This makes it much easier to load and unload while keeping the boat straight and minimizing drift inside the lift. 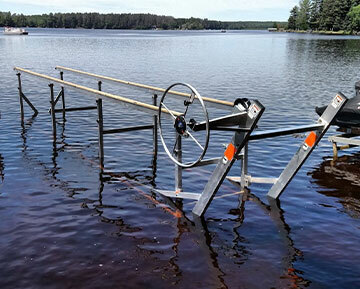 The standard Pontoon/Tritoon racks are also the most cost effective solution for supporting your Pontoon or Tritoon. 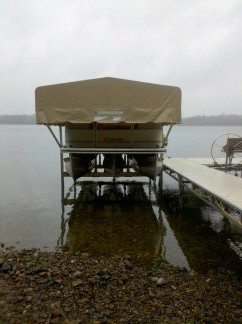 We can also outfit your boat lift with vinyl bunks to cradle each toon individually. This type of setup provides individual support for each toon but sacrifices some stability on longer boats and costs more than our standard hardware. This type of hardware also requires slightly more water depth than our standard hardware. Supporting the boat from under each toon may be the recommended way your boat manufacturer intended. 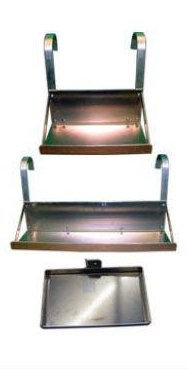 Runabouts, Deck and V-Hull Fishing Boats all require our standard vinyl bunks. Our vinyl covered, aluminum framed bunks contour to the hull of your boat and the vinyl cap will not trap debris like carpeted bunks. The bunks are also little to no maintenance with the vinyl and aluminum combination. This is the most common hardware on vertical boat lifts and comes standard with the boat lift. Direct Drive and V-Drive Ski Boats require our Ski Bunk Hardware. This hardware includes longer stands for the bunks that provide additional clearance for the skegs of the boat. If this hardware is not used in this application, the skegs of the boat and the hoist can be damaged. There are a few applications where the Ski Bunk Hardware can be omitted. Please consult us to determine if this is the case. How much does your boat weigh? When determining the overall weight of a boat, you will need to consider the dry weight of the boat, fuel, and gear. Adding these weights together will allow you to choose the correct lift capacity. The dry weight of a boat can usually be found on the internet. Our favorite source for this information is www.NADAGuides.com. The dry weight they provide usually does not account for outboard motors. Typically gasoline weighs about 6 lbs per gallon. With this information and the capacity of your fuel tank, you can determine how much a full tank of fuel will add to your boat’s overall weight. Take a look at everything stored in your boat. You will need to account for the weight of these items also. Skis, tubes, anchors, wakeboards, etc. Once you have found the weight of your boat and everything in it, you can then determine the correct boat lift weight capacity needed. The width of your boat is commonly called its “beam”. The beam of a boat, pontoon or PWC is the most extreme width of the watercraft. Basically the widest portion of your boat. This information can be found in your owner’s manual. It is also available at www.NADAGuides.com. Once you have this information, you can then determine the inside width needed to easily park your boat on the lift. We recommend adding 10-12 inches for additional clearance to load and unload your boat. For example: If your boat is 101” with 12” of clearance, you would need a 120” wide lift. What is your lake bottom like? Muck or Mud lake bottoms can be the most difficult situations to set a boat lift in. The depth of muck/mud and consistency can determine if Muck Pads are necessary. These are additions to the standard foot pad that make the surface area larger. This will allow the lift to stay on top of the muck. If the muck is very deep or soft, cribbing may be necessary to set the lift properly. This can be very time consuming and will add to the cost of the lift. Rocky lake bottoms usually do not require any additional accessories to be installed. However, large rocks can interfere with the placement of the lift. If these rocks are to be moved, additional costs may occur. Sandy lake bottoms are usually the easiest for us to set a boat lift. Usually no additional accessories or labor are needed in this situation. What is your water depth? This is as simple as it sounds. Usually we like to know what the water depth is where the front of the lift will be and where the rear of the lift will be. Our lifts are generally ten feet long. The easiest method to measure your water depth is to use a tape measure while standing on your dock. Almost all applications will require a minimum 13” of water or more to work properly. Standard installations will usually have no more than five feet of water and 36” or less of water depth difference from front to rear. Anything beyond these parameters will usually require extension legs. Although we have the capabilities to set your lift in water depths up to 14’, this situation will cost more. Any water depths over six feet will be an additional charge and depths over 8’ will be significant. These depths require the use of diving gear to set them properly and will usually require additional bracing for stability. The answers to these questions will allow you to choose the right boat lift. Give us a call or email today for a quote on a Craftlander vertical boat lift. What are they and which one is better? The debate over what style boat lift is better has been raging since the early 90’s. It seems that ever since the vertical style boat lift hit the market the boat lift industry has debated which one is better. Both designs have advantages and it seems that every dealer has a different opinion. 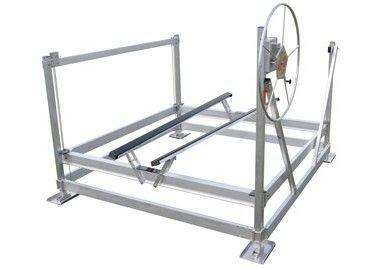 We sell both designs of Craftlander boat lifts. The truth is the best boat lift design is the one that is right for you. Let’s get to the bottom of this and help you figure out what the right lift is. Cantilever Boat Lifts are a simplistic design. They have a fixed main frame and a swinging carriage that the boat rests on. The carriage is designed to swing downward and back as the lift is lowered. Likewise, the carriage swings upward and forward as the lift is raised. The carriage rests on two H frames. These H frames are attached to the main frame and pivot with the carriage. Cantilever lifts are less expensive to manufacture and therefore are less expensive to purchase. These lifts rely on a single cable and two main pulleys with up to three additional pulleys. The weight of the boat rests on the H frames rather than the cable when the lift is in the full up position. This takes stress off of the cable and increases its life expectancy. Some claim that cantilever lifts are better in shallow water conditions. This is only true if the lift is set up out of level. Most homeowners do not accept this. Cantilever lifts have a limited lift height they can achieve. They are restricted by the height of their H frames. Most cantilever lifts can lift to 40” or so. That means that if the lift is in 30” of water, you can only pull the boat 10” out of the water. If you have large waves to contend with then a vertical lift is a better design for you. Also, the carriage can not travel completely down because of the interference of the H frame on the main frame. This means that most cantilever lifts will require more water to operate than a vertical lift. Cantilever lifts do not adapt to fluctuating water levels as easily as a vertical lift. Cantilever lifts will need to be moved in and out as water levels rise and fall. Since the carriage of a cantilever lift travels backward as it travels down, this makes loading and unloading of the boat more difficult. The operator must stop the boat before it completely enters the lift in anticipation of the forward movement of the carriage. The carriage will travel about 30”-36” forward and backward during its travel. Craftlander Vertical Boat Lifts operate with a vertically moving carriage around a fixed main frame. The carriage is suspended by one winch cable and four balance cables. The winch cable carries the majority of the load while the balance cables ensure that the carriage stays level. There are 10 pulleys that guide the cables in a Z pattern through the carriage of the lift. Vertical boat lifts are not restricted by H frames and therefore can lift much higher than a cantilever lift. Most vertical lifts can lift at least 60”. That means in 30” of water a vertical lift raise a boat 30” or more out of the water. This is especially important in areas with large waves and fluctuating water levels. Vertical lifts can operate in lower water levels than a cantilever lift. Craftlander lifts require only 7” plus the draft of your boat of water to operate. If you have a boat with a 13” draft, then a Craftlander vertical hoist will require 20” of water to work. This is about 6” better than most cantilever style lifts. Because a vertical lift lifts straight up and down, it is easier to load the boat on the lift. The operator can stop the boat in the exact positioning desired front to rear. Vertical boat lifts tend to be more stable in deep water applications when compared to cantilever lifts. Vertical boat lifts are more expensive than cantilever lifts because of the additional moving parts. Vertical lifts also require larger more expensive winches to do the same task. This also means that more maintenance is required. Vertical lifts are more sensitive to being out of level. Vertical lifts need to be within 6” of level front to rear and 2” from side to side. If a vertical lift is out of level the carriage will rub on the corner columns and place uneven weight on the cables and pulleys. So, which one is the best for me? Choosing the right style of lift is pretty simple actually. In almost all situations, a vertical lift can do everything a cantilever lift can do only better. Vertical lifts have proven to be just as reliable as a cantilever lift, and vertical lifts offer more flexibility to water levels, lake bottoms and boat hull types. In fact the only real advantage a cantilever lift has over a vertical lift is price, and even this is debatable. While cantilever lifts do offer a lower initial sales price, vertical lifts will hold their value much better. This is because a vertical lift is far more popular than a cantilever lift and will fetch more money on the used market. Often times they bring as much or more than the difference in initial purchase price. Both designs are going to provide you with many years of trouble free use. Give us a call today or drop us an email to learn more. I get asked this question probably a hundred times a year. It is one of the more difficult questions to answer as there are a lot of variables involved. Here is a breakdown of the most common variables. Craftlander vertical boat hoists require a minimum of 7” of water depth to overcome the height of their main frame and carriage. Basically, the main frame is 6” tall and the top of the carriage rests 1” above the top of it when in the full down position. This dimension is true when the legs are removed completely from the lift. This dimension can be reduced if the lift were to be dug into the lake bottom. At best, we have dug lifts in about 3” reducing the height of the lift to about 4”. This is not a preferred method but it does work well when no other options are available. The draft of your boat is probably the most difficult dimension to figure. The draft of a boat is the maximum height of the boat below the waterline while at rest. This can change dramatically depending upon the load in the boat. If you have more people in the boat, the boat is heavier and therefore will have a greater draft. Fuel level, gear, passengers and ballast will all change the draft of your boat. To make matters worse, manufacturers don't always publish a boat’s draft or the information is difficult to come by. The best way to find your boat’s draft is to find a sandy beach and walk your boat up on it. When you feel it start to drag, measure the water depth at the center of the boat. 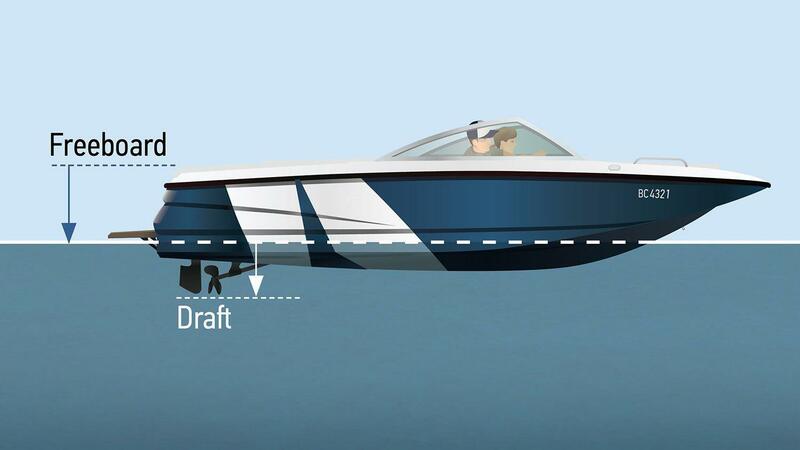 This will give you a good idea of the draft of your boat. Of course, this test should be performed with a normal load in your boat to most accurately represent the normal draft of your boat. If you live on a body of water that has regular fluctuation in its water level, you should consider this. 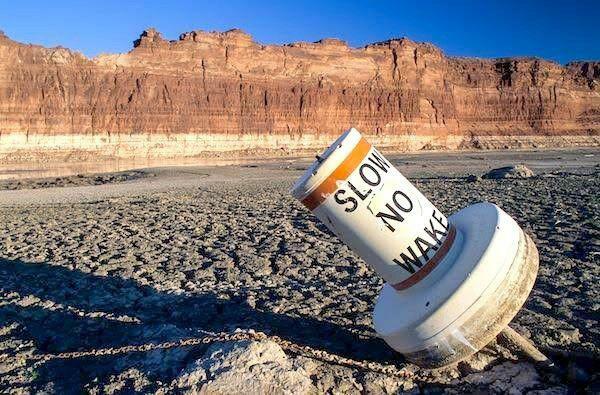 If your lake normally drops 6” every June, this should be added to the minimum water level needed. If your water levels do not normally change throughout the season, then an adjustment for this is not needed. So to figure out how much water you need to allow proper use of your boat lift, simply add it all up. That’s all it takes. I hope I helped clear up this subject a little. If you have more questions feel free to call us or email. Our Standard Canopies offer great coverage at an affordable price. 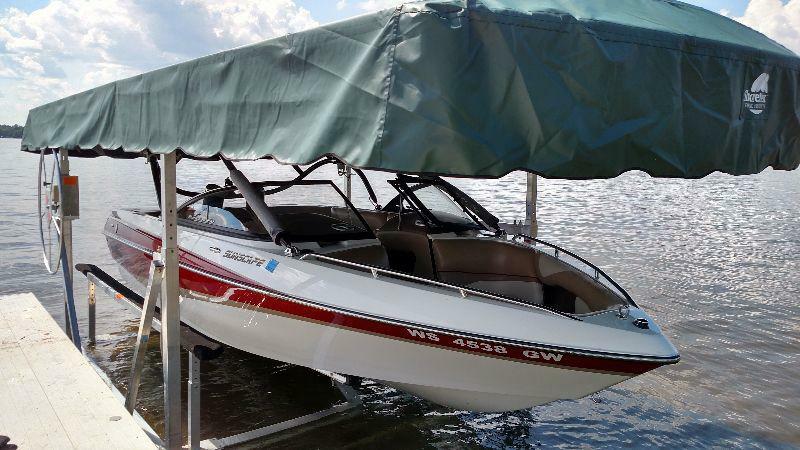 Standard canopies have a streamlined profile that doesn’t block your view of the lake but still provides adequate coverage for all types of boats. The standard canopy comes with a heavy 20 oz vinyl fabric that cleans easily and will offer many years of good service. Several colors are available. Our High Top Canopies have longer side drops and a pitched style roof. 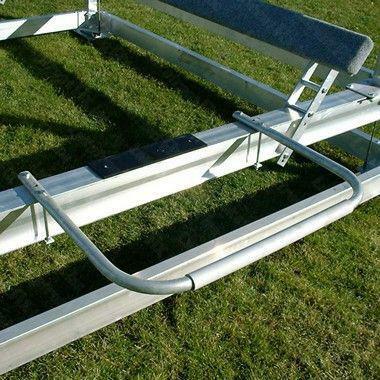 These are great for pontoons and ski boats with towers. The taller coverage will keep dirt and debri out of your boat and also provide maximum UV protection. These canopies offer an optional Zippered Ski Tower End. 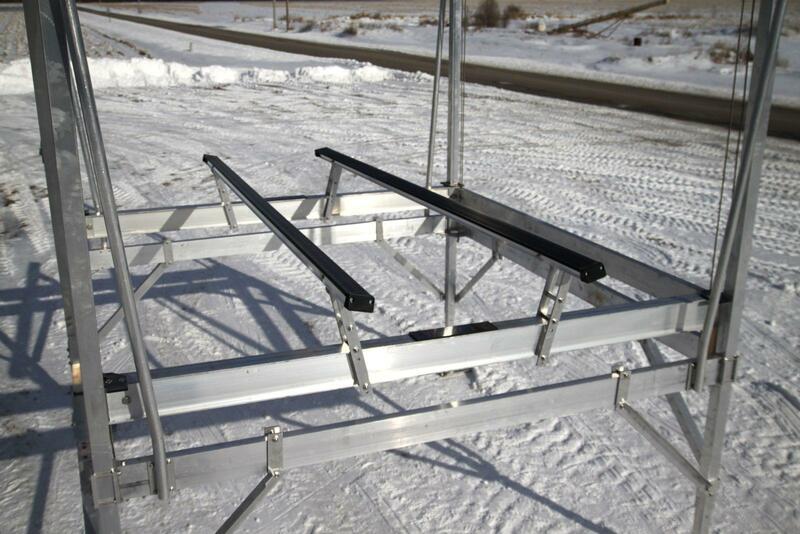 This end is specially modified to allow your ski tower to pass into the canopy without taking your tower down. These canopies also come with a 20 oz vinyl cover. Several colors are available. 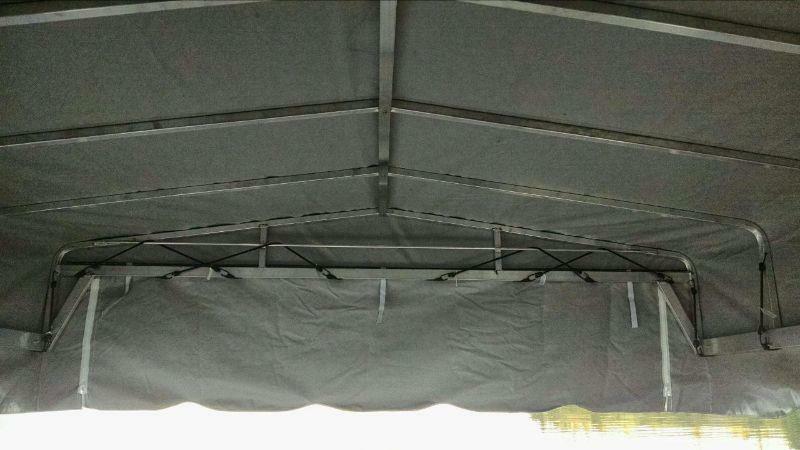 Upgrading your canopy fabric can be a smart idea. Our standard fabrics we offer have tremendous value and are very well made. They are also heavy. You can special order a canvas style material that will allow you great color choices and durability in a fabric that weighs half as much. No matter which canopy you choose for your Craftlander Vertical Boat Hoist, there are a few things to remember. 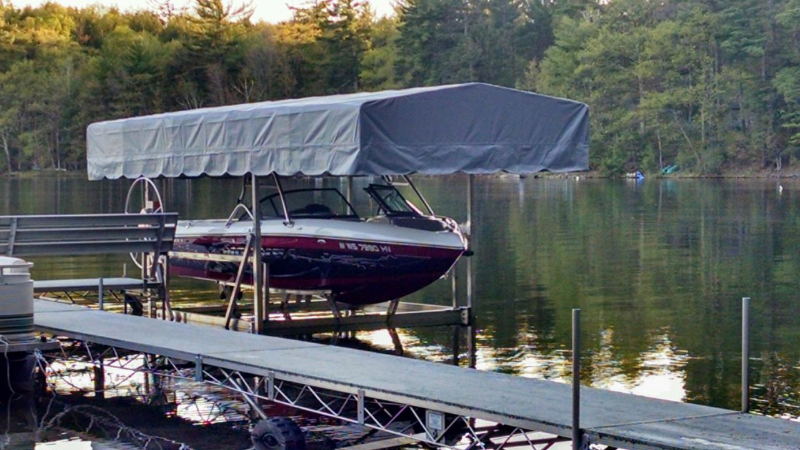 Never leave your canopy fabric on your lift without the boat as ballast. 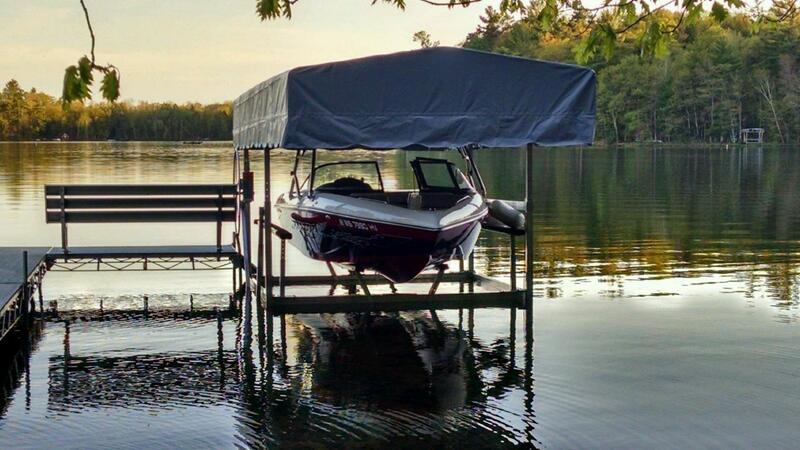 Adding a canopy to your boat lift also makes it more likely to tip over in windy conditions. 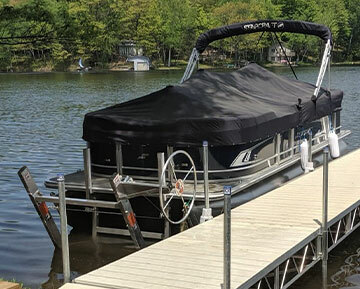 While it is perfectly fine to leave your fabric on while you are using your boat, if you are to leave your boat lift unattended for an extended period of time, it is recommended to remove your canopy fabric. Empty boat lifts with canopies left unattended can blow over in windy conditions. 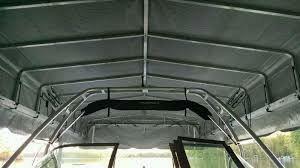 It is also recommended that you use your boat to aid in the installation and removal of your canopy fabric. This makes it much easier as you can walk on the boat to reach the framework of the canopy. So remember, if you are taking your boat off for the season, take your fabric with too. When it comes to accessorizing your Craftlander Boat Hoist, the sky's the limit. It can be confusing and expensive. Follow this guide to help you find the bling that you want, without paying for stuff you won’t use. Our Craftlander Vertical Lifts come standard with a manual winch wheel. The winch wheel is designed to offer an acceptable method to raise and lower the lift with moderate effort. Electric Winch Motors make this task as simple as pressing a button. You are guaranteed to use your boat more with an Electric Winch Motor. 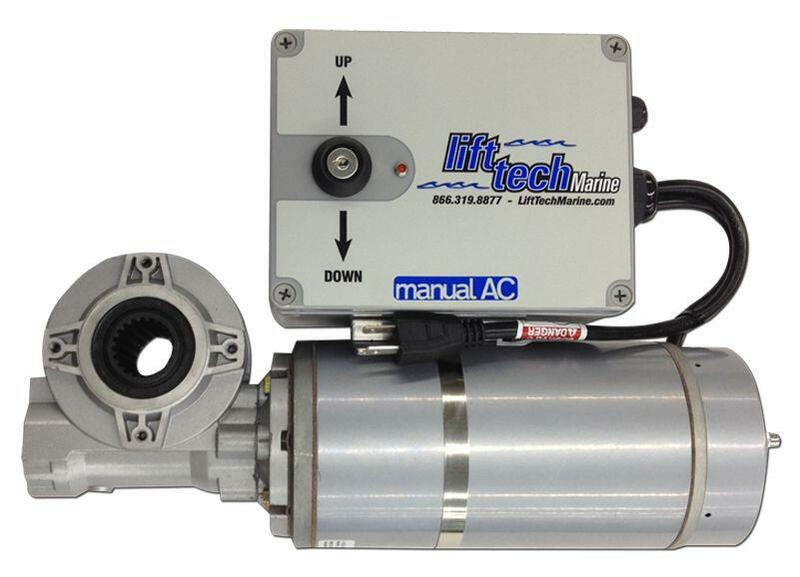 We offer winch motors form Lift Tech Marine. These are the best boat lift motors period. Easy, right? AC Powered Winches are powered via 110 volt AC power (household electricity). Typically customers run extension cords out their dock to the boat lift. This will provide ample power as long as the extension cord length stays at 100’ or less. It is always recommended to use a GFCI extension in line to prevent electrocution. With GFCI protection, these installs have proven to be reliable and safe. AC powered winches have been the most reliable winches for us. Power outages are less common now, and if the power is out, there is an emergency provision included. Simply install our adapter into your cordless drill, insert the adapter onto the winch end shaft and run your lift up and down. Although this is slower than normal operation, this will get you by until the power is back up. DC powered winches are powered by one or two batteries. Two battery setups are twice as fast and the batteries last twice as long. 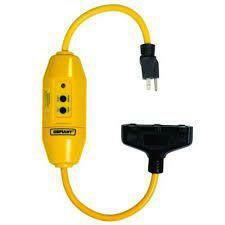 DC winches are a great solution when household electricity is not available or desired. However, there are many other things to consider when choosing a DC Winch Motor. You will need marine boxes for your batteries, a place to store the batteries while using them, and a way to charge the batteries. Although you can strap your batteries to the dock, this does take up some dock space and isn’t the best way to do this. We offer battery trays to clean this problem up. We have trays for one and two battery systems. Charging your batteries is important. Without charged batteries what’s the point, right? A lot of our customers are able to go all season and only charge their batteries once. This is usually accomplished by bringing the batteries to your house and charging them overnight. Others are able to run an extension cord to their lift and plug in a charger overnight. Not everyone is able or willing to do this. That’s why we offer solar charging panels. 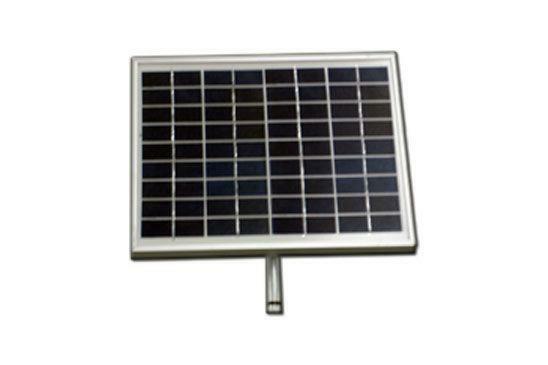 These solar panels will keep your batteries topped off all season. With these you will always be ready to go. Our Electric Winch Motors all come with a keyed switch to operate them. This is adequate for most customers but some want even more convenience. 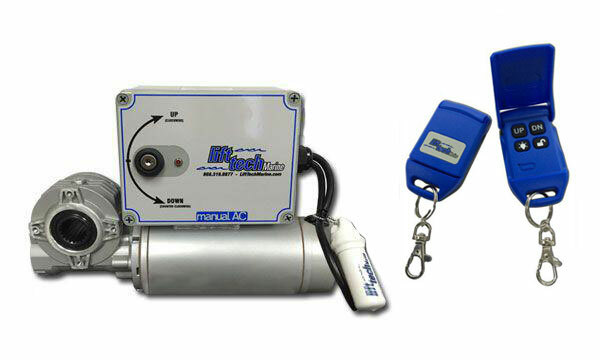 We offer wired and wireless remotes for all of our winch motors. 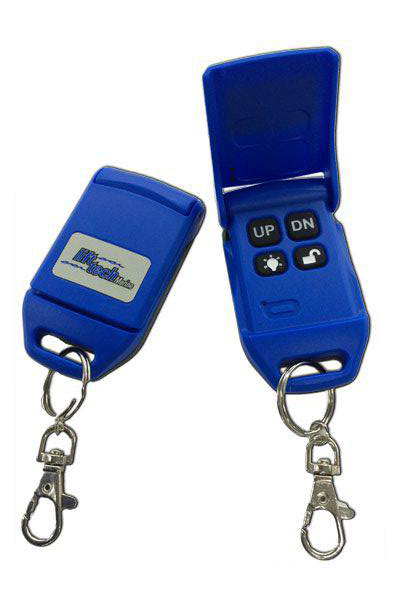 Our wired winch remotes offer remote control convenience in a wired pendant. The pendant is hung near the driver’s control area for convenience. Simply push the button and you are on your way. This allows you to run the lift and your boat without leaving the controls of either. Our wireless remotes offer the same type of convenience as our wired remotes but without the restrictions of wires. These offer a long signal range so you can run your Craftlander Boat Hoist from the comfort of your cabin. Two key fobs are included. Guide ons are a great way to protect your boat while also making it easier to guide your boat on and off your Craftlander boat lift. We offer Carpeted Guide Ons and Foam Guide Ons. Carpeted Guide Ons are far more popular because they are more effective at guiding the boat in place. They also work as an intermediate step between the dock and the boat. 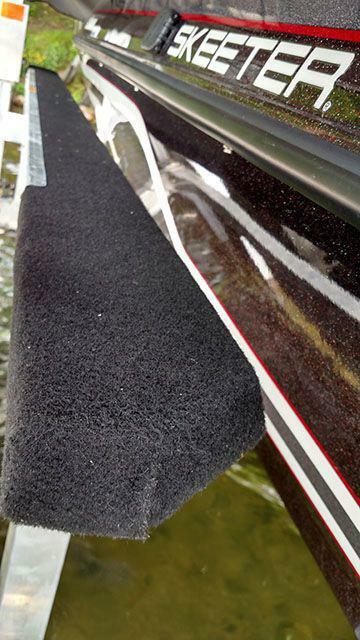 The carpeted surface protects your boat from scratches while also providing an attractive finish. 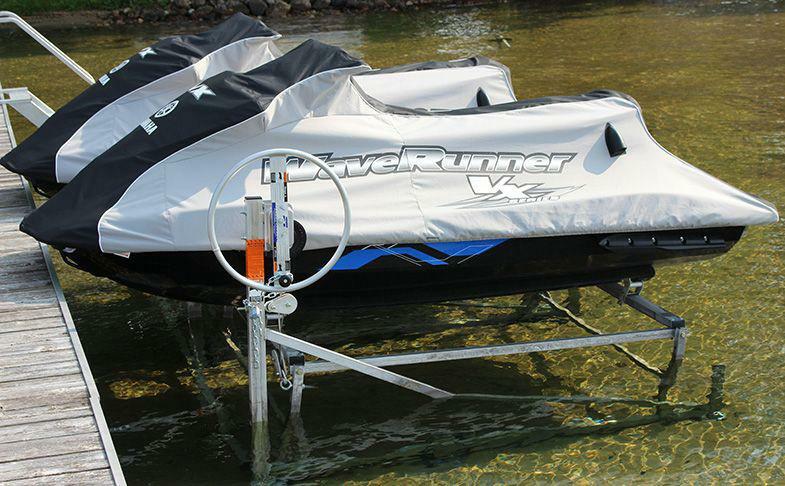 Wheel kits help make it easier to move your Craftlander boat hoist in and out of the water. We offer fixed wheel kits and adjustable wheel kits. 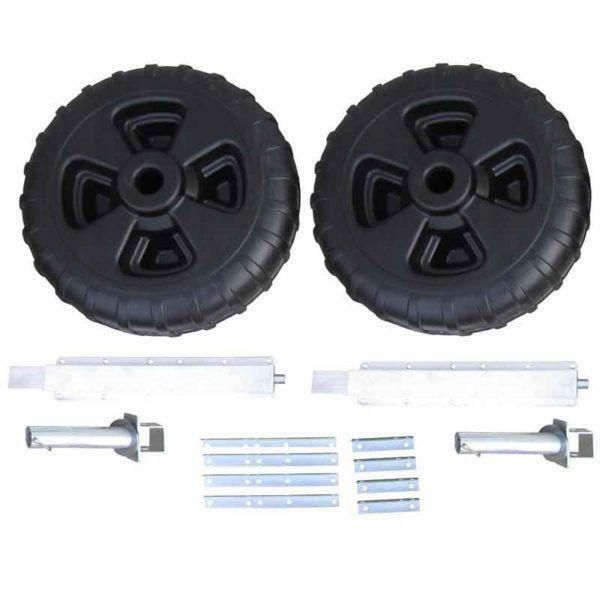 Fixed wheel kits require the customer to manually adjust the legs of the lift. Adjustable wheel kits allow the legs to be adjusted easily and then the wheels can be retracted until needed again. No matter which wheel kit you choose, remember that all of our wheel kits are not load bearing. This means none of the wheels can touch the lake bottom while your boat is on the lift. Motor Stops and Bow Stops help your boat come to rest at exactly the right spot every time. They also help prevent your boat from running “through” your Craftlander boat lift and causing damage to your boat. Motor Stops are used with boats that have lower units. Bow Stops are used for ski boats without lower units and use the bow of your boat to stop. Both methods are designed to bring your boat to a soft stop. Give us a call today or drop us an email. We’ll be glad to help you find all the right accessories for your new Craftlander Boat Lift. So you determined the type and model of lift and accessories needed and now you want to buy it? Great! We make the purchase process as easy as possible. We stock the most common models and accessories to make the turn around time as short as possible. Let’s hit on the major topics of purchasing and installing your boat lift. We sell most of our products as assembled or unassembled. Assembled product prices include assembly and installation. Unassembled products do not include assembly or installation. Delivery for assembled products is included for local customers. A small delivery fee may be necessary for non-local customers. Unassembled products can be delivered on our usual routes. Please contact us for more information about delivery of unassembled products. When you are ready to order your lift or accessories, simply call or email us for a quote. When everything looks good, let us know you want to proceed. We usually do not take any down payment for your purchase. You pay us when we deliver your product or when you pick it up. Items that are being shipped will need to be paid for upfront. When you are ready to pay for your purchase we take several forms of payment. We take personal checks, cash and credit card. We accept all major credit cards but we do charge a 3% convenience fee to do so. We are capable of taking credit cards in the field and over the phone. Throughout the years we have perfected our installation process. We have developed our own tools to make the process as streamlined as possible. Usually we bring your lift to the site unassembled. We will then assemble the lift and its accessories on your shoreline or in the water as necessary. Then we float your lift with our air bag system into place. We are capable of installing your lift in any condition. If necessary, we have a certified diver on staff with all necessary diving equipment for the worst of situations. 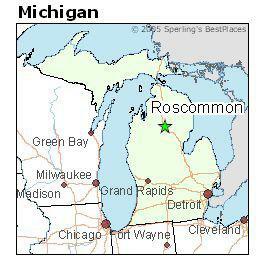 If you live outside of our local area, we run routes throughout the state that combine several installations in one day. This allows us to serve the entire state while still being cost effective. We normally run through any area of the state within two weeks. Please call us to find out when we will be in your area. Because we run routes throughout the state on a regular basis, rest assured that if something does happen to your Craftlander lift we will be nearby. If it is an emergency, we make every effort to respond ASAP. If it is not an emergency, we will be by usually within two weeks to perform any repairs needed. Why Craftlander, Why Lifts and Docks? What is a Craftlander Boat Lift? 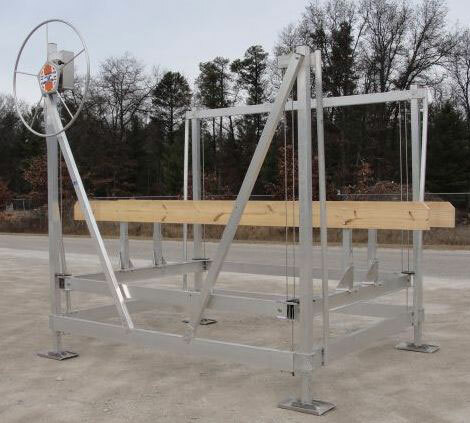 Craftlander boat lifts are manufactured in Roscommon, MI. They have been manufactured here since 1979 by NuCraft Metal Products. NuCraft Metal Products is a family owned business that produces high quality products. We handle all of the shipping process in house. This allows us to control costs and to pass the savings onto you. By controlling the transportation, we can also control the shipping timeline . Craftlander boat lifts are built with the same build quality as any of the industry leaders. We use the same materials and have several design similarities. Craftlander boat hoists have been perfected over the years. Most manufacturers have used the exact same boat lift designs for decades. Craftlander boat lifts are constantly being improved. While most of these improvements are subtle, they are important improvements meant to help produce the best boat lift possible at a price point that is surprisingly affordable. Craftlander boat lifts are constructed of all aluminum frame pieces. Our boat lifts bolt together allowing them to be easily transported. Also, if any damage does occur to your lift, you can simply purchase parts individually rather than being forced to purchase large assemblies. This helps save you money. Our cables are made of stainless steel. The one exception to this is our winch cable. Our winch cable is made of galvanized steel to prevent fraying and to add strength. Our pulleys are made of a self lubricating plastic and have stainless steel bushings. Our Craftlander vertical boat lifts come with a twin I beam carriage construction. The main frame is built from 2”x6” tubing and 3” square vertical columns. Our standard bunks are made of aluminum construction and are vinyl covered. Our Craftlander vertical lifts come standard with a 52” aluminum winch wheel. Our winch boxes are made of the heaviest materials and feature double gear reduction to ensure a manageable winch wheel. Why Are They Priced Lower Than Your Competition? While it is true that Craftlander boat lifts are priced lower than our competition, a Craftlander lift gives up nothing in fit and finish and overall quality. We use the same materials as ShoreStation, Shore Master, Pier Pleasure, and Floe to build our lifts. Our prices are lower because we have perfected the entire boat lift purchasing process. We have spent many years streamlining the process from manufacturer to consumer. Craftlander does not have elaborate advertising programs or dealer financing programs. This can cost a manufacturer a lot of money, and that cost gets passed on to the consumer. Craftlander is also less expensive because they don't use a lot of fancy extruded components. Other manufacturers use extruded pieces to help reduce weight and allow certain proprietary qualities in the design. These extruded pieces significantly drive up the cost of a lift and complicate parts availability. We handle all of the shipping ourselves and we buy in bulk. Our installation process has been developed over many years so we can install boat lifts with less equipment and minimal manpower. You will often find us out on our routes installing five or more boat lifts and covering over 500 miles per day. Craftlander focuses on making boat lifts, we focus on selling, installing, and servicing them. What Makes You The Right Dealer? We will not allow our customers to feel abused or forgotten. Our drive and dedication is fueled everyday by phone calls or emails from new customers telling us their stories of frustration. When you call Lifts and Docks, you will be greeted by friendly people. You will be asked how we can help serve you and what your concerns may be. Our dedication is second to none. We love this industry. We love what we do. We will never stop trying to get better. Every year we dedicate the offseason to make one part of what we do better. Develop new equipment, new techniques, examine our purchasing strategies. You name it, we’ve worked on it and we’ll continue to. This is our industry. Nobody knows more about it and nobody does it better. Yet every morning we wake up and are so thankful to be part of this. We want to thank you for the opportunity to show you why we are better. You will not be disappointed.